Operators seeking employment in the quarrying industry, councils, mining or even companies dealing in large bulk distribution such as grains and woodchip will need to obtain a front end loader licence. The articulated loader licence is now required by WorkCover, even when using a fixed chassis type (non articulated) loader.i.e. a farm tractor and/or backhoe fitted with a fixed front bucket attachment. 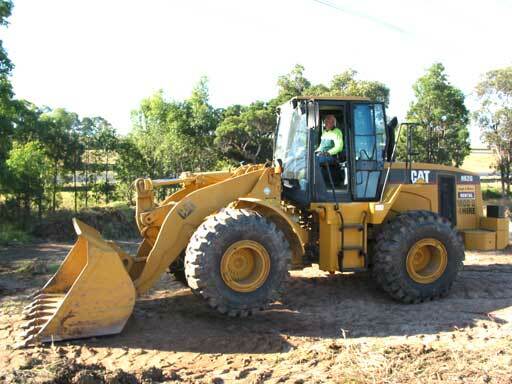 Existing operators who may require upskilling or students seeking to enter the earthmoving industry with a goal of enhancing their employment prospects. 1 - We are committed to one on one training for best results. This intensive 3 day course is designed for students with no previous experience in the operaton of the front end loader. Again, daily rates are available for those students with previous, but limited experience.